This sweet potato frittata creation rose from the ashes of a recipe failure. Several days ago I came across a gorgeous recipe series titled For the Love of Pie, in particular a beautiful entry by Mimi Thorisson. Potatoes, bacon, onions and herbs… it’s all very French countryside, rustic and wholesome. I immediately began plotting a Paleo recreation to be produced in, well, my urban apartment in San Francisco. Not quite the same effect as the original post, but I thought I had a stylish presentation concept for the pie itself that would outweigh my lack of scarred wooden tables, cottage stonework and adorable toddlers to populate my pictures. By slicing the (sweet, in my version) potatoes thin and arranging them in a spiral layer, the geometrical effect was intended to approximate these apricot, pistachio and lemon shortbread tartlets on a full scale. Let me tell you, when the pie came out of the oven it looked great. The problem is, you can’t bake layers of raw sweet potatoes enough for the bottom layers to soften without the top layers burning! Isn’t real food frustrating? The top of the pie was softened while the rest of it was crunchy. Particularly heartbreaking was the fact that bacon + sweet potatoes is a flavor combination of genius. I stood in the kitchen and devoured warm, clumsy chunks of that ridiculous crunchy pie because its deliciousness was undeniable… and that’s when I decided to rework the presentation, abandon my precious geometry and serve up a humbler-looking frittata version using the pre-roasted sweet potato method to ensure zero chance of crunch. This sweet potato frittata combines a trio of my favorite ingredients (eggs, bacon, and sweet potatoes) and ended up being a bit of a riff on sweet potato breakfast hash. 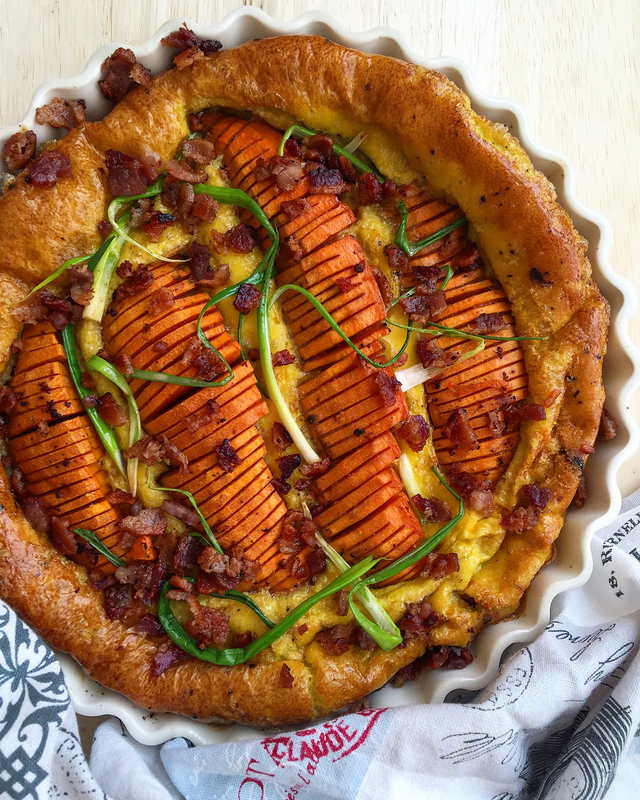 You get the heightened flavor and sweetness gained by oven-roasting the sweet potato slices before arranging on a pie plate and whisking eggs into the gaps. If it sounds simple, that’s because it is (also, the bacon can be cooked and the sweet potatoes roasted ahead of time). I love a dish that can be put together in under five minutes from pre-cooked ingredients before I stagger back to bed on a weekend morning… only to emerge golden and glowing from the oven 40 minutes later. Note: this recipe is a rework of a previously-published (and incorrectly named) sweet potato quiche. If you’re a fan of the older recipe, click here to view. Preheat the oven to 400 F. Heat a skillet over medium heat and cook the bacon until brown and crispy. While the bacon cooks, slice the sweet potato lengthwise into quarters and each quarter into ¼” rounds. Spoon a teaspoon of the grease out of the skillet into a pie pan as the bacon renders, cool enough to touch, and then thoroughly coat the pie pan. Arrange the sweet potato slices in the pie pan, and spoon several more teaspoons of the bacon grease over the slices. Cook the sweet potatoes for 15 minutes in the preheated oven. While the frittata bakes, remove the bacon pieces from the skillet and set aside on a paper towel-lined plate to drain. Once cooled to the touch, crumble or chop into pieces. Pour the grease out of the skillet and cook the green onions for a few minutes over low heat until wilted. After the frittata has baked for 30 minutes until firm, remove from the oven and top with the crumbled bacon and wilted green onions. Serve warm. That frittata is beautiful and looks absolutely amazing. I’m doing a happy dance right now because I just remembered I have a sweet potato in the fridge! Yay! I’m making this on the weekend and I’ll probably end up throwing the precooked ingredients together in the morning and going back to bed too. Do it! It’s so easy and cozy. What a great paring. I’m going to try this. 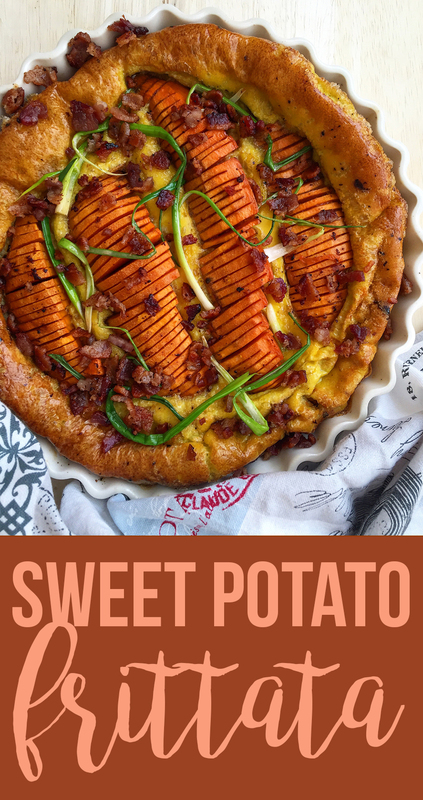 Such a pretty dish, we love sweet potatoes and I know my family would enjoy this recipe! What a perfect way to have breakfast for dinner. Or even a great way to start the day. Thank you for sharing this delicious recipe! Such a brinner fan over here, yep. This dish looks so good! 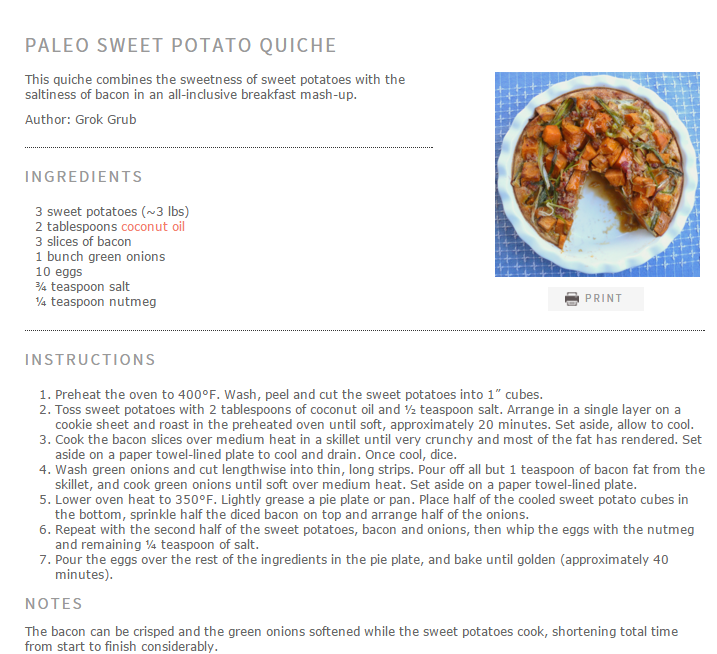 I love how you used sweet potatoes, this looks like a great fall recipe. Haha, I eat sweet potatoes ALL YEAR! This is so gorgeous! Loved your story, too. I’m definitely going to try this! I. Love. This. I am pretty much obsessed with sweet potatoes right now so this is perfect. I also love how stunning it looks!! And so easy to prepare! 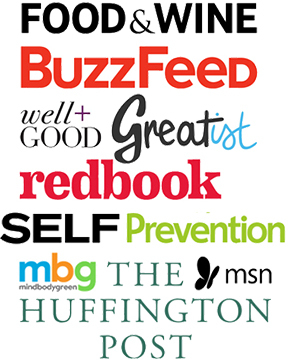 Great for company! !